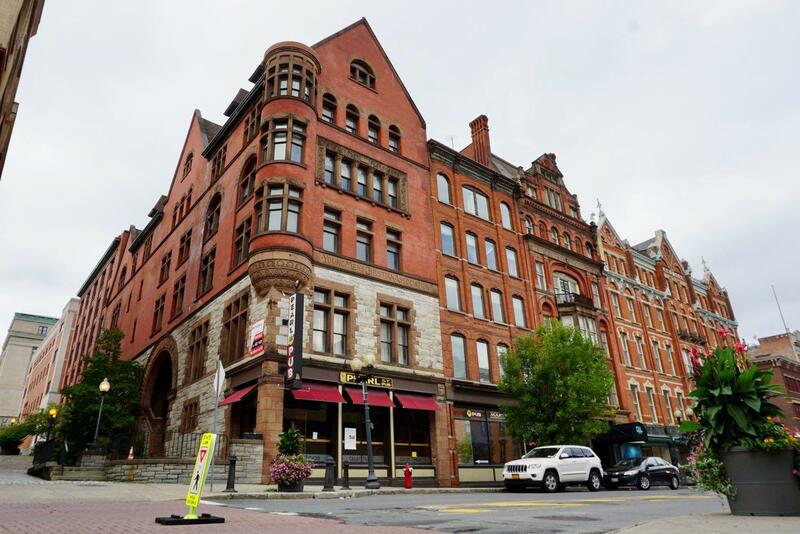 Redburn Development was back before the board for its planned residential/retail redevelopment of the old Steuben Club and Kenmore Hotel buildings on Pearl Street downtown. The two buildings -- which are linked together and cover an entire block -- are part of the "Kenmore portfolio" of seven prominent buildings the company is acquiring downtown. Jeff Buell -- one of Redburn's principals -- quickly mentioned to the board that company was 12 days away from closing on the properties. The Steuben and Kenmore projects had been before the board multiple times already and were just waiting on a few technical reviews. Damien Pinto-Martin -- a VP of development at Redburn -- provided a quick overview, and reiterated the company's goal to encourage people to live downtown and make the place an "18-hour" neighborhood. There was little discussion from the board and no public comments. The board voted 5-0 in favor of the approvals for each building. Speaking of Redburn and the Kenmore portfolio... 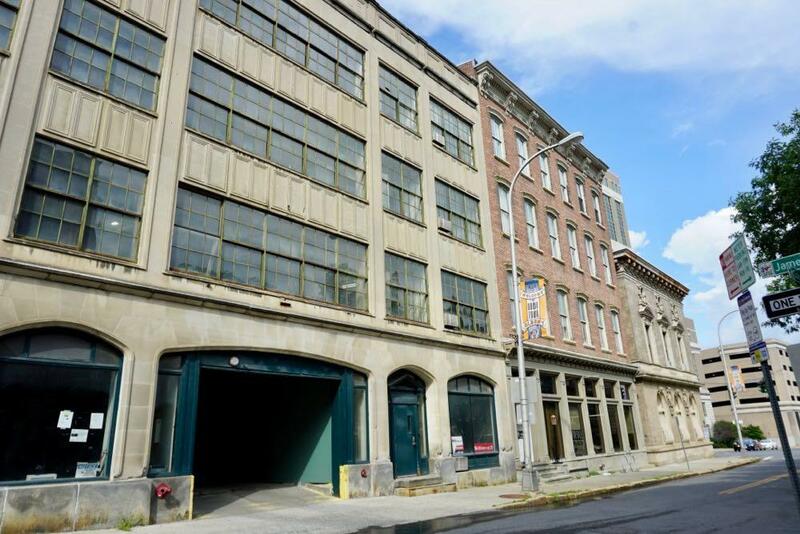 The company's proposal to convert a portion of 43 Columbia Street -- the Kennedy Garage -- to residential was up before the board for the first time. Damien Pinto-Martin did the overview. Redburn wants to convert the upper levels of the historic garage -- it dates back to 1925 and was one of the first parking garages in the city -- into 27 apartments and would add an extension to the fifth floor to do so. The lower levels -- some 50,000 square feet -- would continue to be parking. A new exit would be added to the side of the garage, allowing people to drive out into the adjacent alley and head toward the 787 ramp. Pinto-Martin explained that Redburn is aiming to create different sorts of options with the various buildings in the Kenmore portfolio. The conversion of the former Times Union building on Sheridan would be aimed toward a more affordable segment of the market. 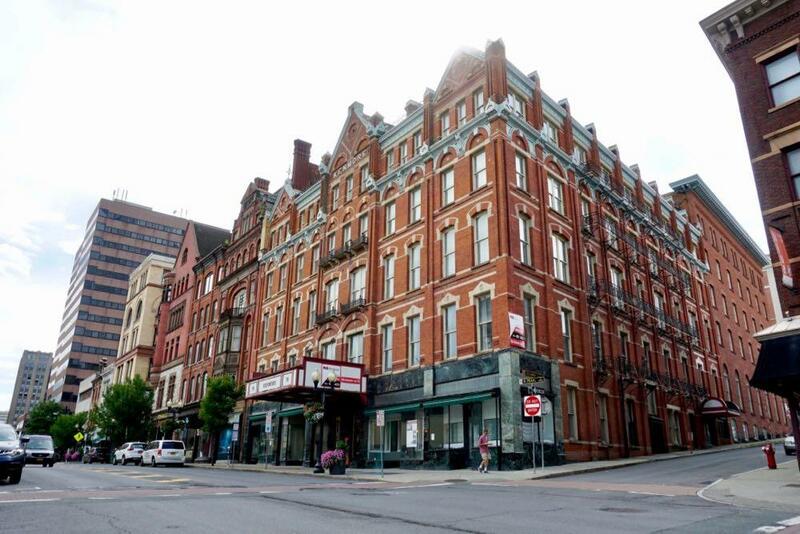 The Steuben and Kenmore buildings would be more upscale. And the Kennedy Garage would allow people to park in the same building in which they live. 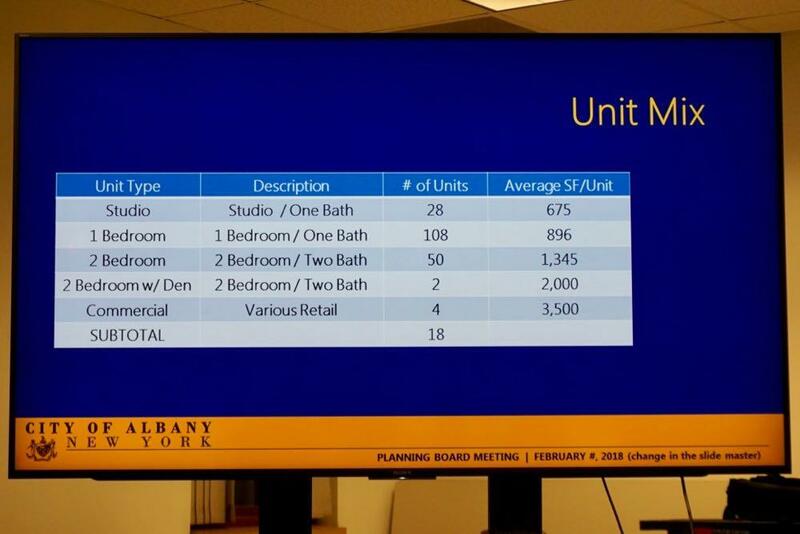 The Kennedy Garage units would average 827 square feet and be mostly 1 BR. He said the conversion of the building would follow historic renovation guidelines. 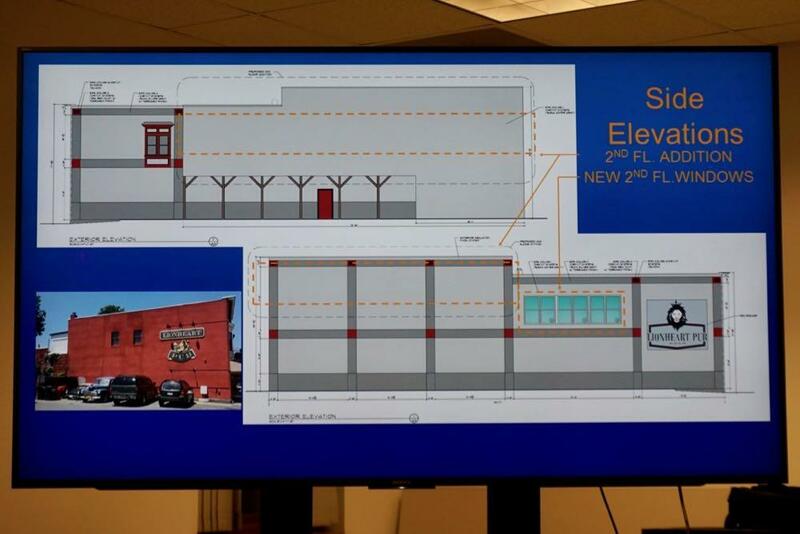 There was some discussion with the board about the potential new exit from the garage, and the configuration of the fifth story extension (about 60 percent of existing roof space would be covered, though the addition shouldn't be visible from the street). This was a getting-to-know-you appearance, and the project will be back up in the future. 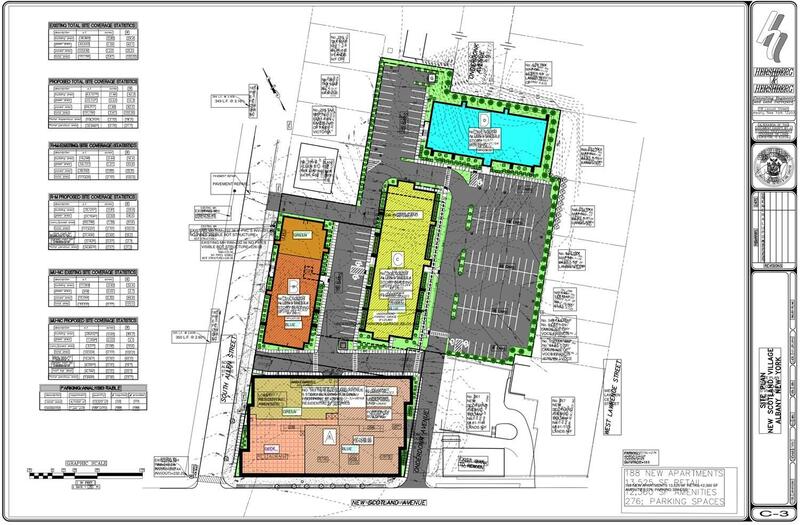 As mentioned recently, the Jankow Companies is proposing a large residential/retail development at the corner of New Scotland Ave and South Allen Street across from St. Peter's Hospital. It would involve demolishing the retail buildings along New Scotland, as well as a set of apartment buildings and a single-family home on South Allen. 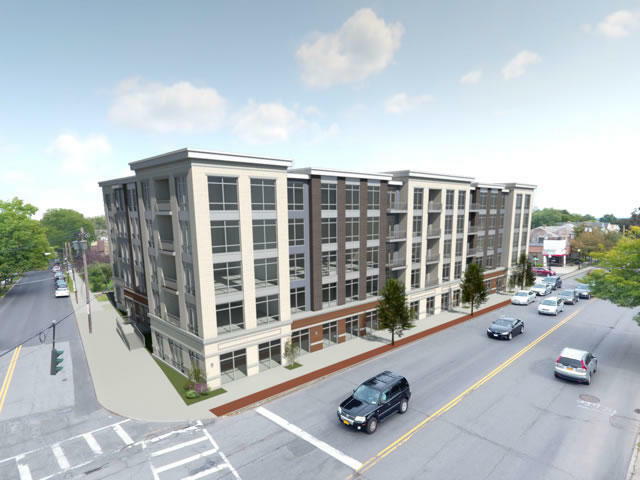 In their place: 188 apartment units across four buildings (a 5-story, two 4-story, one 2-story), and 13,575 square feet of retail space in the 5-story building along New Scotland Ave. The retail square footage tentatively includes space for a restaurant, retail shop, the Post Office that currently occupies the site (the developers say they currently have no commitment from USPS), and a coffee shop. 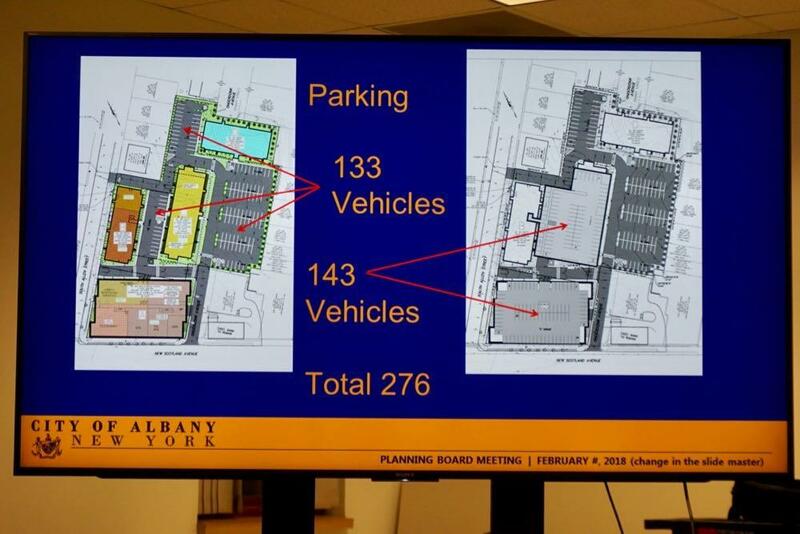 There would be 276 parking spaces, 143 of which would be underground. You might remember there was a somewhat similar project proposed by a different developer last year. That project did not go over well with the planning board or neighbors. And it appears this new proposal has tried to take some lessons from last year's episode. So this project has pulled much of the mass of the project forward to New Scotland Ave and South Allen, away from neighbors along the back edges of the property. Click the image for a larger view of the site plan. + The retail spaces will have movable glass wall windows so they can open to the street. + Tenant amenities would include an Uber/Lyft waiting room, bike storage, meeting rooms, storage lockers, dog park and grooming room. + And something new to us: There's a plan to include "hospitality rooms" in the layout. These would be rooms that tenants could rent for visiting guests to stay in -- sort of a guest room on demand. Phaff said they're projecting the apartments will draw a mix of tenants, about a fifth of which they expect will work at St. Peter's. Discussion with the board centered on two topics: parking and height. Regarding parking, board chair Al De Salvo said he wondered if the project had too many parking spaces, resulting in a sea parking on the east side of the project. He wanted to see more green space instead, or something to break up the parking. Board member Martin Hull said the space between the two four-story buildings near Allen -- which under the proposed design would be parking -- could maybe work as a green courtyard. Hershberg said the developers thought the parking was necessary, but maybe they could work out an arrangement in which some of the space for parking is "banked" -- only to be converted if the need is demonstrated. On the height issue, De Salvo floated the idea of increasing the height of the New Scotland Ave building another story in order to reduce the the height of the two four-story buildings. He noted that St. Peter's Hospital is already much taller and just across the street, so the additional height could be OK in that context. Developer Ryan Jankow -- who's behind the Playdium redevelopment -- interjected that they'd be willing to consider that. The projects proposed for this site have been the subject of a series of neighborhood meetings over the past two years, and the tone of those has largely been skeptical. 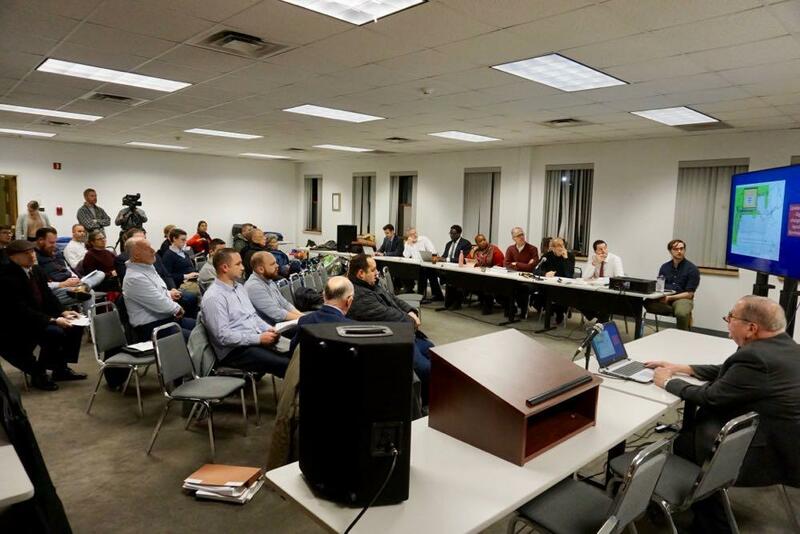 But Thursday night the public comments took a different course, with multiple speakers expressing support for the project, even if they might like to see some changes. In fact, no one who spoke outright opposed the project. A few speakers praised the addition of density to the neighborhood and the potential benefits to walkability. Others said they generally favored something being developed at the site given there could some green space added to the project. Winne Street resident Aaron Corman laid out a case for shifting the New Scotland Ave building back from the property line in order to open up more sidewalk space. 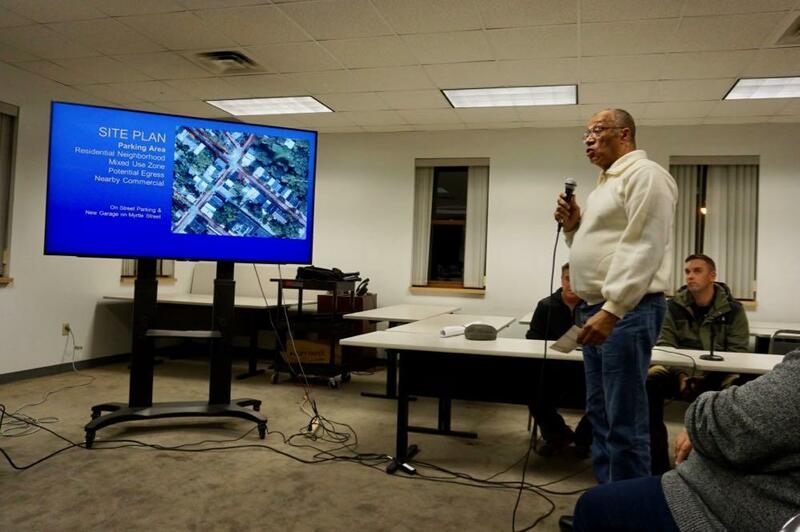 He pointed to the success of the retail strips along Madison Ave (at Western Ave) and New Scotland Ave in the Helderberg Neighborhood as evidence for the potential of this extra space. Others echoed the desire to see the building set back. And a few other commenters highlighted the traffic safety and congestion problems along New Scotland Ave, and urged the board to keep those issues in mind. This was a concept review for the project, so there were no votes and the project will be back up in the future. Chris Hacker and Michael Gilhooly were seeking seeking a conditional use permit for the conversion of an old laundromat building into a two-story, one-family residence at the corner of Philip and Myrtle in the Mansion Neighborhood. Hacker appeared before the board with T.J. Dinan of Harris A. Sanders Architects and gave an overview of the project, which would involve adding a second story and a garage to create a 3BR home. Hacker noted the building had a second story at one point that served as a residence and that the building had been damaged years ago by a fire in an adjacent building. The property was acquired from the Albany County Land Bank. There was some quick discussion with the board about materials and layout. And then it was on to public comment. This project has hit a few snags along the way, as Amanda Fries recently reported. One of them is that Hacker ended up overstepping the scope of the construction permit when he realized the roof was failing and proceeded to remove it. 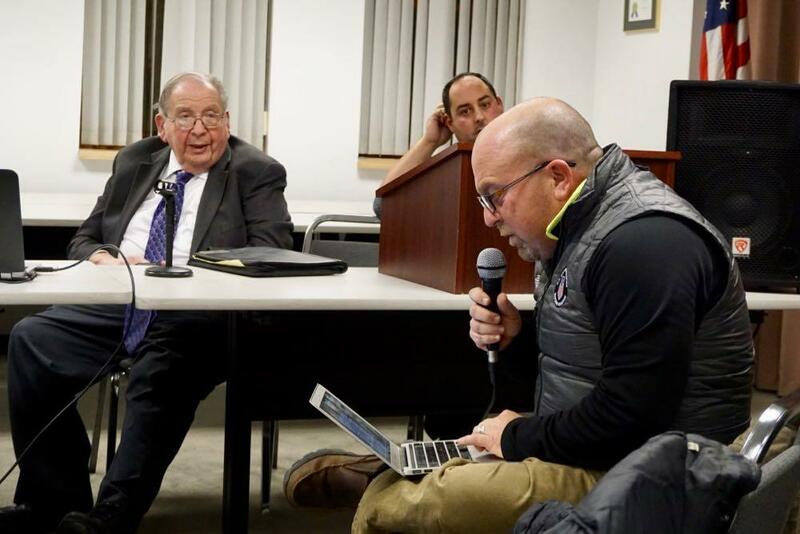 He acknowledged that issue again before the board in response to a comment from Myrtle Ave resident Danielle Hille, who criticized the project for not being mindful enough of the neighborhood. Holly Katz -- chair of the Mansion Neighborhood Association -- said that overall the neighborhood is in favor of the project and that the plans had been adjusted to address some concerns about stormwater runoff issues. A nearby resident said he was still worried about the stormwater issue and just wanted to make sure it wouldn't be a problem. As the board approached a vote, board member Christopher Ellis said he wanted to make sure the stormwater issue would be adequately handled. And that prompted a discussion about whether the board could issue the conditional use permit with the condition that the Albany water department review the situation -- and, if the steps taken are found to be inadequate -- the project would come back before the board. And that's what the board ended up doing, approving the permit 5-0. Brad Glass -- the city's planning director -- asked the people in the audience who were concerned about stormwater to leave their contact info so the city could set up a site visit with the water department. Jerry Aumand -- who re-acquired the Lionheart Pub on Madison Ave this year -- was before the board seeking a conditional use permit to expand the second story of the building to add space for dining and a nano-brewery. The exterior would also be getting a makeover. He explained that he saw such an expansion was possible under the new zoning, and he said it would allow the Lionheart to offer a light menu, host catered events, and expand its popular dart league. He said the brewery would be a two-barrel system that would only produce beer to be served on premises. There was some back and forth with the board about specifics of the plan, how the layout would work, and whether there'd be any impacts in terms of sound or crowds. Chair Al De Salvo said he had heard complaints from the neighborhood about the way the previous operator had handled noise and people smoking outside. Aumand said they had addressed those issues. The project wasn't up for a vote, and will return for a public hearing on the permit at a later date. Albany Academy's proposal to build a new 31,000-square-foot gym behind the field house on its campus was back up again after a vote on it last month was held up as the board waited on a stormwater plan review. Daniel Hershberg gave a very quick overview of the stormwater plan. The board had no questions. The crowd had no comments. And the project got the necessary approval by a 5-0 vote. The massive development proposed for the old Kenwood campus on the southern edge of the city along Route 9W was before the the board for the first time. An entity called Kenwood Commons LLC is seeking district plan approval for the project, which as proposed, would include 35 structures -- some as tall as 8 stories -- with almost 4 million square feet. That square footage would include approximately 2,224 residential units, 575 hotel rooms, and more than 400k square feet of commercial or community space. Development would occur over 10 years. There's a lot to get into on this project, and we got a chance to talk with one of the members of the development team after Thursday's meeting. We'll have a few more bits about it next week. The project's appearance Thursday was relatively brief. Daniel Hershberg -- joined by developer Jacob Frydman -- gave a quick overview of the project, mentioned some of the work that's already been done on the sewer system at the site, and highlighted plans for a new roundabout on 9W at Kenwood Road. But the appearance was largely about an administrative matter: Having the planning board declare itself the "lead agency" for the purposes of the State Environmental Quality Review Act (known as SEQR -- "seeker"). Typically this sort of action is almost an afterthought because most projects don't trigger a full-scale review under that law. But this project will require that environmental review, so having the planning board declare itself the lead agency is a notable step. The board voted 5-0 in favor of doing so. And as chair Al De Salvo concluded: "We will be seeing this project a number of times." Great, thorough coverage Greg, as usual. 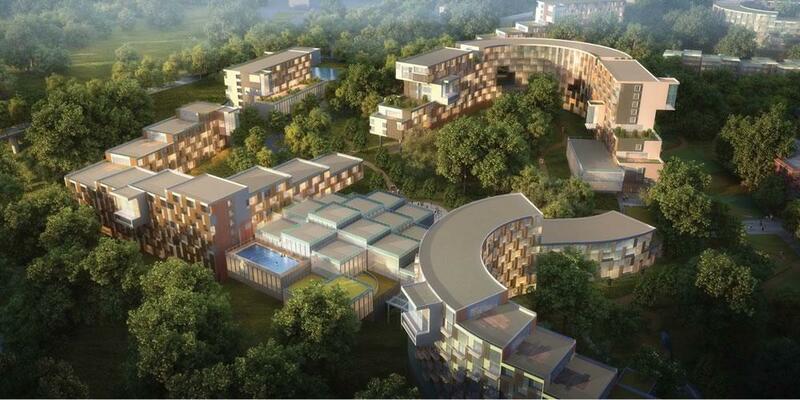 Wish I could've stayed for that Kenwood project. That developer is quite ambitious. Big Big NO on the Kenwood project....it's the type of development that got us into this rut in the first place.....looks like great piece of planning..... from 1965! Who are the people on this planning board and where do they hail from and what is their training and background??? ?....Academy gym project looks rather lackluster.... New Scotland project NEEDS to get going ASAP but this isn't the answer.....who the hell would plop down a Clifton Park building in the middle of a yearning to be vibrant walkable neighborhood...so out of proportion for the area. And finally the Kemore/Steuben development has the potential to be the lynch pin most important development going forward for the city of Albany...do it right and we all benefit.....screw it up and it will be a pock mark on our trying to revive city. Google them for their qualifications. I believe you'll be quite impressed. I agree about Kenwood, but's it's pretty isolated and already disconnected from the city because of geography. academy gym project looks rather lackluster but won't be visible from the street. And it's a gym. Funny thing about the Clifton Park example, that community is trying to CREATE a "downtown" with these buildings (https://dailygazette.com/article/2018/08/20/town-center-initiative-aims-to-create-a-downtown). I think what you're getting at is that a form based code overlay (like we have elsewhere in the city) would be beneficial here. Would you be willing to reach out to your council person for this? Sounds like there was really promising public feedback on the New Scotland project! Thanks for covering this, Greg! I agree that the development on New Scotland could be way better. The developer should try to create more of a "village" feel with architecture that has more of quaint look and not just a strip mall design that happens to have residential above it. It should be set further back from the road to create a wide sidewalk as well.